The general consensus in Washington is that Speaker John Boehner’s career is on the line during the debt limit talks: If he makes a deal that’s seen as selling out the Tea Party and other “real” conservatives, the House Republican conference will dump him and install current Majority Leader Eric Cantor, with whom they are thought to have much better relations, as the new speaker. Certainly, grassroots conservatives have little love for Boehner, and some are already calling for his head on a spike. But Boehner can take partial solace in the fact that, right now, not even Eric Cantor—the man who everyone assumes wants to be speaker—would be crazy enough to covet Boehner’s job. Cantor would be wise to keep Boehner as speaker, at least for the rest of the current 112th Congress, because what really separates Boehner from grassroots conservatives and other true believers is neither temperament nor issue positions, but the simple fact of where he sits. Unlike Cantor, who must cooperate with the speaker but can at least do so with a wink, always keeping at least a little space between himself and an eventual deal, the Speaker of the House really doesn’t have the option, when push comes to shove, of just blowing everything up. And when the speaker cuts deals, true believers are going to get angry. Indeed, one of the recurring themes in American politics is that partisans really don’t understand, and don’t accept, the limits of electoral victories in a Madisonian system. Just as some liberals cannot forgive Barack Obama for failing to pass climate legislation or failing to include a public option in the Affordable Care Act, many Republicans now simply won’t forgive John Boehner for supporting any compromise on the debt limit. Of course, if Cantor wants to be speaker someday, he’ll eventually have to take the deal-making and compromising that comes with it. But right now is a terrible time to do it. For one thing, with a Democrat in the White House and a Democratic majority in the Senate, there’s no one else for activists to blame. For another, expectations are always the highest right after a landslide electoral victory, and it’s safe to assume that they’ll fall over time. And while its somewhat less safe to predict that Republican RINO-hunting and Tea Party insistence on ideological purity will abate as time goes on, it certainly seems to be at a historically high point. Finally, the current showdown over the debt limit won’t be the last of the big deals that Boehner will likely be forced to cut. After all, we’re only weeks away from the end of the 2011 fiscal year and a likely confrontation with the Senate and the White House over FY 2012 spending—a confrontation that will have to end, sooner or later, with some sort of deal. Bill James used to say that fans of a losing team always blamed the star player, no matter how good he was, for the team’s failure. After all, the star was the most visible guy, and since no ballplayer is perfect, it’s always easy to find real or perceived flaws in even the best of them. That’s what’s going to happen to anyone who serves as Speaker of the House for the Republicans during this term. Whatever they win, they’ll be perceived as losing; the difference between what they ran on and what they can get is just too large. 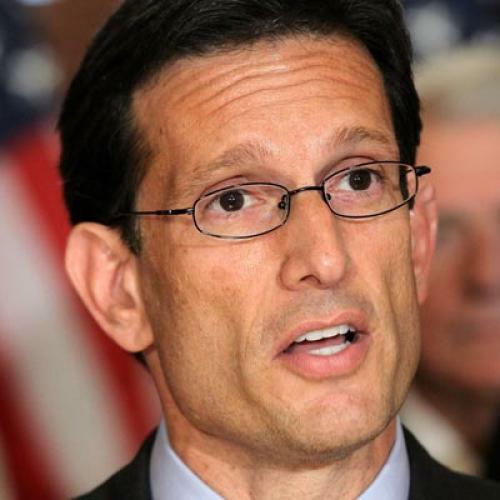 And so, for now, Eric Cantor’s best play is to keep Boehner right where he is.